Orthotics can help a wide range of conditions such as Flat Feet, Arch Pain, Plantar Fasciitis, Bunions, Gait Dysfunction & Abnormalities, Heel pain, Runner’s knee, Shin Splints. We understand that everybody has different requirements, so we prescribe various types of off the shelf insoles or custom made orthotics to suit you and your needs, whatever your condition. We treat both children and adults. 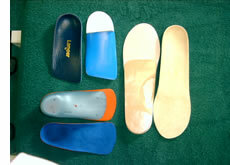 Our custom-made orthotics are specially designed for you to correct any abnormalities in your walking pattern. And many, many other conditions.